In Times of Trouble, Love Wins Out! We are fine! In fact, we are better than we were! Krispy Kreme celebrated their 79th birthday Wednesday and they had a great special at the Krispy Kreme store on Plank Road. Buy one dozen and get the second for 99 cents! The line was long, and I was in it! So right there, in the middle of Krispy Kreme, we prayed! We both cried as she told her story. Her name is Kasey Jackson. Her mother died when she was in the 11th grade, but she had really been raising herself since elementary school. She knew what it was like to be poor and wanted to do better than that! She loved school and worked hard. She attended Istrouma High School and worked so hard that she was the valedictorian of her graduating class in 2003. Kasey attended Southern University and in fact became the first person in her family to go to college. She kept working hard and earned her degree and then launched her career in education. 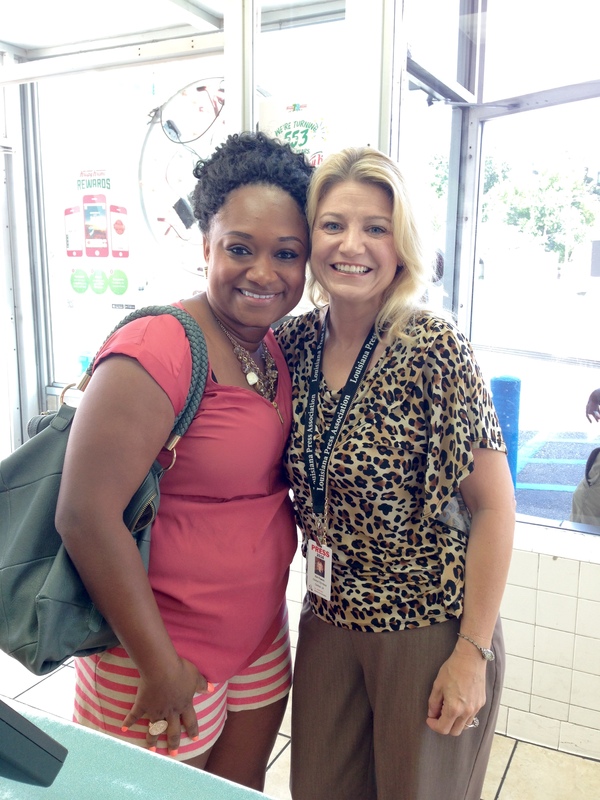 In a few weeks, she will be an assistant principal at Crestworth Elementary School in North Baton Rouge! Kasey has a four-year-old son. Thinking about him brought more tears to her eyes and mine. “He asks questions, and I just don’t know…” She shakes her head. I agree. We are all just people, and we should be judged by the content of our character, not the color of our skin. This week in Baton Rouge, we have learned something else — we can be better people! Over the past week, I have seen kinder people. I have seen friendlier smiles. I have seen people of other races reaching out to me. Yes, I have also seen great sadness and sometimes anger. But here in Baton Rouge we are working through it all together. We have leaders here who are working hard, leaders who are dedicated to making our community a good place for everybody. We have people like Kasey Jackson, praying for people like me, doing her best to be a great mom, and teaching and loving our children in the very school system that she is a product of. We do not need outsiders to come here to “help” us figure out how to respond to adversity. We will be fine, because we love each other, and we love our town. We are indeed blessed to call Baton Rouge home!